Total official development assistance (ODA) to agriculture projects doubled over the last decade, from US$3.0 billion in 2003 to US$6.1 billion in 2012. 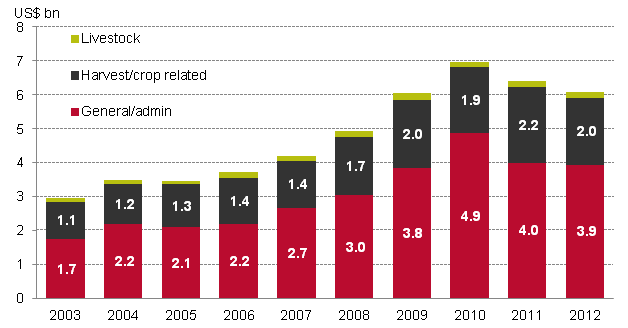 But 2012 amounts are 13% lower than the US$7.0 billion peak in 2010. We have broken this total down into three sub-groups: general projects and administration, harvest (crop-related) and livestock. * While amounts of aid have increased for all forms of agricultural aid in real terms, the overall share going to harvest and livestock projects has decreased. General/admin ODA was the largest sub-group in every year from 2003 to 2012, amounting to US$3.9 billion in 2012 (65% of agriculture ODA), and peaking at 70% in 2010. Harvest/crop related ODA was the second largest agricultural sub-sector throughout this period, increasing an annual average of 7%, accounting for around a third (32%) of total agriculture ODA in 2012. ‘Agriculture’ refers to the DAC purpose codes under the agriculture sector (311) plus agro-industries (purpose code 32161). All figures are in US$, 2012 constant prices, gross disbursements to all eligible recipients from DAC donors, Non-DAC donors (Kuwait and the UAE) and multilaterals that report to the OECD DAC CRS. Data for 2013 will not be available until Dec 2014. * General/admin captures ODA going to agricultural administration, policy, training, research, finance and development. Harvest/crop related captures ODA going to crop production, land and water resources and other pre- and post-harvest related activities.